OnTheIssues.org has reviewed several pro-Hillary books and several anti-Hillary books, but this book is in a category of its own. The author focuses exclusively on exploring Hillary's faith and how it affects her issue stances. One might not think that faith plays a large role -- i.e., Hillary's detractors might want to reframe this book's theme as WHETHER faith affects her issue stances -- but the author makes an honest appraisal and concludes that Hillary's faith is sincere, and sincerely affects many of her beliefs. The author, Paul Kengor, has published two related books (among other publications): "God and Ronald Reagan," and "God and George W. Bush." There is no book entitled "God and Bill Clinton," which leads us to believe that Mr. Kengor favors Republicans and is part of the religious right. While this book does not explicitly discuss the author's politics, there is little either to disavow that assumption. Despite the anti-Hillary stance inherent in that political philosophy, this book is balanced and thoroughly researched. Hillary sought pastoral guidance on several important issues, from capital punishment to dealing with Bill's infidelity, and would presumably do so as President. Bill Clinton does make a substantial appearance in this book. While Mr. Kengor unambiguously concludes that Hillary is sincerely religious, Kengor is considerably more cynical about Bill's sincerity and beliefs. Kengor concludes, however, via the same methodology as with Hillary, that Bill applies the Biblical definition of social justice to his policy stances on poverty and welfare. 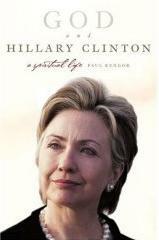 We include several excerpts about Bill's stances, but the book focuses on Hillary. We do omit several whole sections of the book from our excerpts. For example, Kengor explores in great detail Hillary's meetings with Mother Theresa and the Pope. Since no policy-based conclusions are drawn from these meetings, and no conclusions about Hillary's personal philosophy either, they are not relevant for our website. Those interested in a deeper religion-based analysis of Hillary's character should read the original book for further details. For all voters for whom religion is important or even moderately relevant, this book is a fascinating character study. Al Gore: US should not seek international right to abortion. Bill Clinton: 1980s: pro-choice since Bible defines life starting at birth. Hillary Clinton: 1974: pro-choice fervency not based on any personal abortion. Hillary Clinton: 1993 health plan included RU-486 & widely available abortion. Hillary Clinton: 1999: keep abortion safe, legal & rare into next century. Old Testament: Biblical "personhood" defines life starting at birth. Rudy Giuliani: 2000: ran against Hillary as a pro-choice candidate. Hillary Clinton: 1962: met MLK Jr. preaching a sermon in Chicago. Hillary Clinton: 1965: brought black classmates to all-white church. Hillary Clinton: Supports DOMA, which Bill Clinton signed. Bill Clinton: 1980s:Sought pastoral counsel on capital punishment decision. Old Testament: Capital punishment not forbidden in Ten Commandments. Hillary Clinton: 1969: held herself aloof from college drug counterculture. Hillary Clinton: 1980s: her church founded largest daycare in Arkansas. Hillary Clinton: For teens, not about birth control, but about self-control. Hillary Clinton: Family planning & child spacing is international human right. Bill Clinton: 1980: housed Cuban Marielitos; riots ensued against KKK. Hillary Clinton: Allegedly pro-PLO in 1960; but pro-Israel by 1981. Hillary Clinton: 1978: chaired Legal Services Corp. while at Rose Law Firm. Hillary Clinton: Passion for healthcare rooted in Jesus� teachings. Hillary Clinton: 1999: overturn don�t-ask-don�t-tell so gays can serve openly. Bill Clinton: 1955: attended church on his own accord at age 9. Bill Clinton: Part of his �New Democrat� included religious Democrats. Bill Clinton: Still angry at Ken Starr for tawdry details. Bill Clinton: 1996: faith community most scandalized by Easter liaison. Bill Clinton: Familiar with Bible & has genuine faith, say his pastors. Hillary Clinton: 1963: called Saul Alinsky �great seducer� of young minds. Hillary Clinton: Early character development: standing up to a bully. Hillary Clinton: Sought pastoral guidance on doubts about capital punishment. Hillary Clinton: Dealt with Bill�s infidelity via counseling & Book of Psalms. Hillary Clinton: Sincere Christian & lifelong member of religious left. Hillary Clinton: The politics of meaning: individuality is part of society. Hillary Clinton: Amalgam politics: make labels irrelevant. Hillary Clinton: Old-fashioned Methodist; reads Book of Resolutions & Bible. Hillary Clinton: Strong identification with Eleanor Roosevelt. Hillary Clinton: Endured Monicagate through faith and inward spirituality. Hillary Clinton: 2000: campaigned heavily in African-American churches. Bill Clinton: Reform attacked by Christian left; but genuine middle ground. Bill Clinton: Biblically-inspired social justice, especially serving poor. A Spiritual Life, by Paul Kengor.